If you're a licensed Chief Mate or a Master, with experience in handling varied Petroleum cargoes . . This is a non-seagoing responsibility that will utilize all your previous marine opera- tions experience and your knowledge of tanker and tug operations. To be responsible for overseeing the load- ing and discharging of petroleum products, including both safety and anti-pollution controls. These people will be right in the hub of the activities of one of the largest—and still growing— tanker ports in the world, and involved with some of the biggest VLCC's. As one of the fastest expanding of the International Oil Companies, we offer an excellent salary and benefits program including complete relocation expenses to this sub-tropical island. 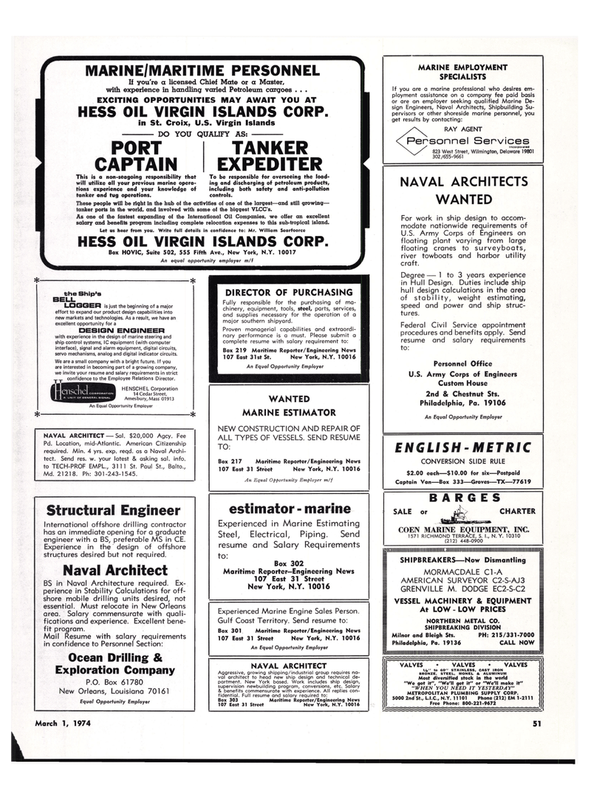 HESS OIL VIRGIN ISLANDS CORP.
DESIGN ENGINEER with experience in the design of marine steering and ship control systems, IC equipment (with computer interface), signal and alarm equipment, digital circuits, servo mechanisms, analog and digital indicator circuits. We are a small company with a bright future. If you are interested in becoming part of a growing company, we invite your resume and salary requirements in strict _I_T confidence to the Employee Relations Director. International offshore drilling contractor has an immediate opening for a graduate engineer with a BS, preferable MS in CE. Experience in the design of offshore structures desired but not required. BS in Naval Architecture required. Ex- perience in Stability Calculations for off- shore mobile drilling units desired, not essential. Must relocate in New Orleans area. Salary commensurate with quali- fications and experience. Excellent bene- fit program. Fully responsible for the purchasing of ma- chinery, equipment, tools, steel, parts, services, and supplies necessary for the operation of a major southern shipyard. Experienced Marine Engine Sales Person. U.S. Army Corps of Engineers on floating plant varying from large floating cranes to surveyboats, river towboats and harbor utility craft. Degree — 1 to 3 years experience in Hull Design. Duties include ship hull design calculations in the area of stability, weight estimating, speed and power and ship struc- tures. Custom House 2nd & Chestnut Sts. Most diversified stock in the world "We got it", "We'll get it" or "We'll make it" "WHEN YOU NEED IT YESTERDAY"